NIA CHARLESTOWN NEVIS (September 02, 2014) — Brianna Brantley of the Charlestown Secondary School (CSS) topped the 2014 Caribbean Secondary Education Certificate (CSEC) examinations among Nevis’ three secondary schools with 11 subject passes among them nine Grade 1’s. 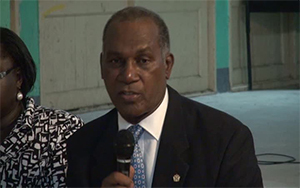 Premier of Nevis and Minister of Education, made the formal announcement in a statement at a town hall meeting at the Gingerland Secondary School auditorium on September 01, 2014. Brantley, he noted, was one of several students on the island who had done well in the 2014 overseas examinations and described the overall results as satisfactory. 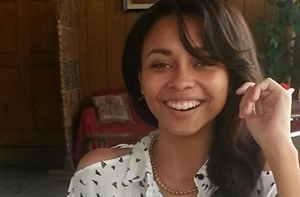 “The top student at the CSS is Brianna Brantley who passed 11 subjects with 9 Grade 1’s. One other student Justin Herbert also passed 11 subjects with 7 Grade 1’s. Ten other students passed 10 subjects and 8 students passed 9 subjects, 11 passed 8 subjects and 14 passed 7 subjects while 10 passed 6 subjects,” he said. The CSS registered 131 students and 836 subject entries and obtained 642 passes with a 77 percentage pass rate which registered a one percentage improvement over the results of 2013. They obtained 136 Grade 1’s, 238 Grade 2’s and 266 Grade 3’s. Regarding the Gingerland Secondary School, Mr. Amory noted that the results were also satisfactory. “For the Gingerland Secondary School, we have a similar success rate where 69 students entered for 410 subjects, obtaining 330 passes for a pass rate of 80 percent which is an increase of some five percent over last year. I think this is commendable and the principal and staff of the school need to be commended. “For the individual results…one student called Cordiesere Walters passed 12 subjects and she had four 1’s. Leandre Dyer passed 11 subjects and he had two Grade 1’s. Three students passed 10 subjects. Kelsia Liburd passed 10 subjects with seven 1’s, J-Eonne Dore passed 10 subjects with five 1’s and Vanel Bailey passed 10 subjects with three 1’s. Those are the students at the top of the pile,” he said. In the case of the Lyn Jeffers School (renamed the Nevis International Secondary School), the island’s sole private secondary school, five students wrote exams Mr. Amory noted. “They are a smaller school. They entered only five students and they recorded a 78 percent pass, 23 subjects and 18 passes. “There were two 1’s, three 2’s and 13 3’s for those students. The student with the highest number of passes is Keelia English who passed 10 subjects. There were no distinctions but to pass 10 subjects requires some effort. One student Mr. Wazim Allie passed five subjects and one student Thomas Knapton passed two subjects and he was the one who received two 1’s as his return on his examinations. There are six subject areas at that school which recorded 100 passes,” he said.